I thought the value for money was really good. The waterslides are fantastic - not what one would expect from a small town private hotel. They were in great working condition as was the pool. Really great. 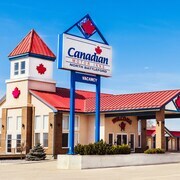 Where to find North Battleford hotels near an airport? 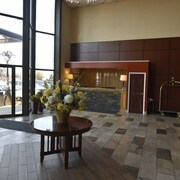 Where can I find hotels in North Battleford that are near tourist attractions? 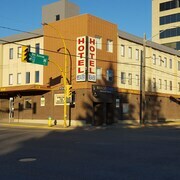 If you are hoping to book a hotel near downtown North Battleford, there is a small range of places. Downtown North Battleford has 6 hotels and apartments within 0.1 kilometres (0.1 miles). 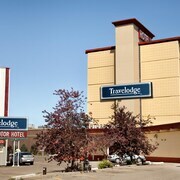 You will find the Tropical Inn and Travelodge North Battleford within strolling distance from the center of North Battleford. 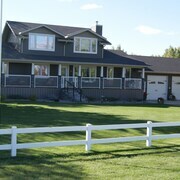 Coming from the heart of North Battleford, it is 30 kilometres (19 miles) to the Hanna's Haven Bed & Breakfast. 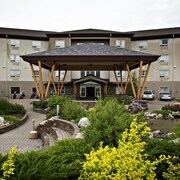 For travelers planning on arriving via John G. Diefenbaker International Airport, you may plan to book a room at The James Hotel, or Delta Hotels by Marriott Bessborough, which are both close. Leaving home doesn’t have to feel like being away from the comfort of home if you spend your holiday here. There’s just something about North Battleford hotels, restaurants, parks, and shops that makes everybody feel warm and fuzzy inside. We're pretty sure that fruit pies from the famous orchards of Saskatchewan will make you feel like you're in your grandmother's kitchen. It might interest you to know that many professional Canadian athletes have primary and summer residences in town. This little city in sunny Saskatchewan enjoys some of the longest annual daylight hours in all of Canada. Summers here are warm and dry. Temperatures often reach 38 degrees Celsius in the daytime. Freezing temperatures and snowfall make the area a popular destination for winter sports enthusiasts. Spring and fall offer transitional temperatures and relatively clear skies. The versatility offered by the climate keeps the lights inside hotels in North Battleford Saskatchewan burning bright all year long. In addition to getting back to nature, take a little time to discover history and culture on this holiday. Travel back to pioneer days at the Saskatchewan Western Development Museum. Get your art fix at the acclaimed Allen Sapp Gallery. Golf courses, beaches, and picnic areas pepper the landscape in the Battlefords Provincial Park. Adding all these fun activities to your vacation list will be a breeze when you’re not worried about paying high rates on overnight accommodations. Take a little time today to grab the guaranteed best deals from us here at Expedia.ca. 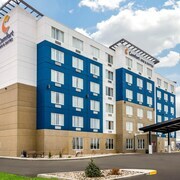 What could be better than booking cheap hotels in North Battleford SK? Try tacking on a North Battleford flight for just a little extra. Our all-inclusive offers are simply the smartest option for saving money on family vacations and romantic getaways for two. Our travel tools give you the freedom to choose which top attractions you want to stay near. Save big on your holiday plans by booking your overnight accommodations on Expedia.ca while the best deals are still around. Are there hotels in other cities near North Battleford? 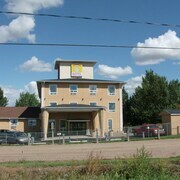 What other types of accommodations are available in North Battleford? Explore North Battleford with Expedia.ca’s Travel Guides to find the best flights, cars, holiday packages and more!